Our fist chocolate-covered strawberry Valentine's Day fundraiser was very successful. Thanks to everyone who participated in making and delivering the strawberries! The demand for strawberries exceeded our expectations, but we had fun making them! Penn Habitat helped host the 10th Annual Friarside Coffee House this week! Each November, Habitat partners with Friars Senior Society and Castle Fraternity to put together an amazing night filled with performances from ten different Penn arts groups and delicious food and coffee donated by local campus restaurants. Our fundraising committee solicits the food donations and all proceeds from the event benefit Habitat! This year, we raised over $1800, an amazing feat. Shout out to everyone who helped make the fundraiser such a success! Coalition just completed its third rake day this Sunday! With twenty-seven appointments shared between ourselves, Temple, and Drexel, there are many more to come but it wouldn't be possible without the members of Habitat's committees, our wonderful executive board, general body members, and the help of APO brothers. Every person who participates helps make each rake day as easy and fun as possible. Whether it's sharing croissants in the morning for breakfast or grabbing lunch at a diner together, Rake-a-Thon helps build connects within our Habitat community and in meeting our generous donors it becomes clear how valued Habitat for Humanity is outside our own Penn bubble! Hey Penn Habitat! We have been working with Habitat Philadelphia to start having build days on Fridays. In the past we only built homes on Saturdays, but realized that Friday builds would really increase our impact. We are very happy that so many students responded to our interest survey and want to help out! Thanks to everyone planning to volunteer on a Friday build. Habitat Philadelphia has a lot of corporate and student volunteers on weekends, but struggle more to fill the sites during the week. By sending students on Fridays, we can increase the productivity of Habitat Philadelphia work sites and help get families into their homes faster. I’m looking forward to our first Friday build – keep your eyes open for more details coming soon! Fun times at the Habitat Committees Potluck! This past Saturday, members gathered at our co-president Kristin's house for an evening of food & fun. Our members are as awesome as the service we do, so everyone enjoyed bonding over the assorted potluck meal of dumplings, pasta salad, desserts and more. Thanks to everyone who attended our first Habitat committees social event and look forward to more fun events soon for both committee members & the general body! This week, Shayna and I traveled to Habitat Philadelphia headquarters to learn more about our affiliate and how we can have a great year. Did you know that Habitat Philly has increased its operating budget from $1,000,000 to $4,000,000 in the past three years? Seniors, that's the same time we've been in school (just saying...). This year, they accepted 12 new families into the homebuilding program, and 65 families to the home repair and weatherization program. Remember everything you do here at Penn helps them with that goal. We just had an amazing first build in Pitman, NJ. There was amazing turnout - there were 16 volunteers - who all showed up bright and early, no less, to drive over to Pitman for a morning of hard work. Because we had so many people, the Pitman coordinators accommodated us in two houses (thanks!). One of the houses was pretty much done in terms of work, so about 6 students stayed behind to help paint, sand, and clean up. It's a beautiful house, by the way - apologies for forgetting pictures. Oops. The other students went over to a half-completed, restoration house. Basically, a bank foreclosed on the house, but the house was in pretty bad condition and remained unoccupied, so the bank generously donated it to Habitat for Humanity! Instead of tearing down the entire house, Habitat decided to selectively restore the unpleasant parts. So our work included tearing out old windows and unnecessary stuff. Two of the volunteers basically became expert window removers, a couple of us used a sledgehammer for the first time, and one of us got horribly wet within the first five minutes. All in a day's work! This is the state of the house now. It's coming along, don't you think? Thanks to everyone who came to the build - it was an amazing way to kick off the year. Hope to see you at the next build! It's that time of year again: Rake-a-thon is on the horizon! Coalition, along with Temple and Drexel, are hoping to make this year's annual fundraiser the most of successful one yet. Whether it is flyering, driving, or raking, there is always a way that you can contribute to this year's fundraiser, so stay in tune for more details! Outreach/Education committee is excited to kick off this school year with a couple of events in the coming few weeks, more details to come. We also hope to increase our collaboration with other clubs on campus, so if you would like to help us reach out to clubs that you are in, we would love for you to join our committee. Looking forward to seeing everyone soon! From our build coordinator, Erica: "I hope you are ready to come out and volunteer for some great builds. 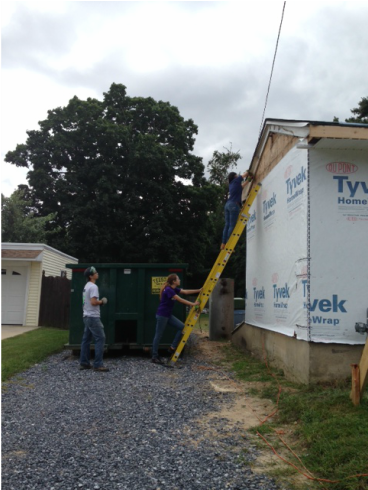 Our first Penn Habitat build is tentatively scheduled for Saturday, September 14. Stay tuned for more information about how you can get involved during our first GBM." - Check out this article about the Rural Studio in Alabama, an architecture program that builds innovative housing for the poor in the deep south. They're moving to make their designs commercial for the first time. Let's hope this leads to an increase in high quality affordable housing throughout the country! - Be on the lookout for a fun social event during the first week of school! "Hi everyone, I'll be updating the website with build dates, events, and other Habitat info. The website is http://www.pennhabitat.org. Make sure to provide feedback if you have any comments or suggestions for the site! For the latest information, be sure to visit our website, and follow us on Twitter and Facebook! The fundraising committee had a great semester! We supported Relay for Life by sellinggrilled cheese and henna tattoos. This was our second grilled cheese fundraiser of the semester and it was definitely a hit! We also organized a jelly-bean guessing game on Locust walk, with gift cards donated from local businesses as prizes for the winners. Overall we had a successful semester, especially in terms of brainstorming new annual fundraisers. Thanks to all of our committee members and supporters who helped out. Thanks to everyone for a great semester! Have a great summer, and stay tuned next semester for more details about our annual Rake-A-Thon Fundraiser in the fall. Thanks to everyone that supported Act! Speak! Build! Week. Our speaker dinner, coffee chat, and Shantytown were great events. See you next semester! We ended the semester strong with our last build on Saturday, April 6th! Thanks to everyone that came out to help. Stay tuned for future builds beginning again in the Fall semester. We finally have the Service Week underway! Starting the day after exams end, a group of Penn students will be volunteering with Habitat Philadelphia. We'll get to know one another through group meals and volunteer work, and people will finally have the chance to experience a build without worrying about schoolwork. The group will be composed of approximately ten students who, alongside the help of Habitat for Humanity construction crews, will work on Habitat Philadelphia's newest project! - Thanks to everyone who supported our Relay for Life team! We raised $120 as a group to donate to the cause. - Last Monday, Shonda Brinson, Volunteer Coordinator for Habitat Philadelphia, came to Penn Habitat's exec meeting to discuss our upcoming projects and planning! We all had fun getting to know her, and had a great conversation about Habitat's goals, our May service days, and our upcoming build workshop next semester. We all hope that Shonda will become an increasingly visible member of our team. For the latest information, be sure to visit our website at http://www.pennhabitat.org, and follow us on Twitter and Facebook!